Sunday 21 Apr - Latest - Dyson (£399.99) currently have stock of Dyson Supersonic Hair Dryer (23.75 Karat Gold/Blue). Dyson (£299.99) currently have stock of Dyson Supersonic Hair Dryer (White/Silver). 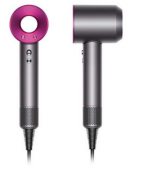 Dyson (£299.99), John Lewis (£299.99) and Currys (£299.99) currently have stock of Dyson Supersonic Hair Dryer (Iron/Fuchsia). Dyson (£299.99), John Lewis (£299.99) and Currys (£299.99) currently have stock of Dyson Supersonic Hair Dryer (Black/Nickel). We constantly check for Dyson Supersonic Hair Dryer stock, so you don't have to. Receive email alerts when Dyson Supersonic Hair Dryer online stock is found.